The original and the best preserving jars. Solid construction with thick walled glass. 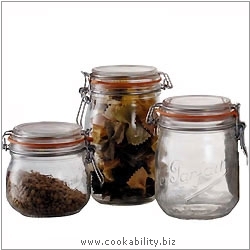 These deluxe jars come complete with rubber sealing rings and the classic metal sealing clip. Perfect for pickling, preserving, jam making or even for storing tea, coffee or sugar.